A recent guest column to the Union-Bulletin arguing for destruction of the four Lower Snake River dams claimed the dams "only make about 4 percent of the Northwest's electricity, and our region already produces more power than we use." This one sentence is both misleading and false. First, the dams provide about 7 percent of Washington's electricity, equivalent to the power produced by every wind turbine and solar panel in the state. Imagine saying we should destroy every wind turbine in the state. The four authors would shriek about the "climate crisis." The dams produce significant amounts of clean, renewable energy, by their own standards. Second, the claim that our region produces more power than we use is wrong. According to the NW Power and Conservation Council, by 2021 our region will have a shortfall of energy. It will get worse in 2023. Destroying the dams would only make that situation worse. Finally, they claim replacing the energy would be inexpensive and would improve the reliability of the grid. The study they obliquely refer to, paid for by a group that wants to destroy the dams, does not say that. In fact, their study says it would increase costs for families but would not completely replace the energy from the dams. Pay more. Get less. Further, the study relies on intermittent sources of power like wind. The study says the grid could absorb the reduction in predictability -- at a cost -- but it certainly does not say it would improve reliability. Advocates of tearing down the dams resort to misleading and false claims because the science is not on their side. Energy Efficiency: The region should aggressively develop energy efficiency with a goal of acquiring 1,400 average megawatts by 2021; 3,000 average megawatts by 2026; and 4,300 average megawatts by 2035. Efficiency is by far the least expensive resource available to the region, avoiding the risks of volatile fuel prices and large-scale resource development, while mitigating the risk of potential carbon pricing policies. Along with its annual energy savings, it helps meet future capacity needs by reducing both winter and summer peak demand. Demand Response: In order to satisfy regional resource adequacy standards, the region should be prepared to develop significant demand response resources by 2021 to meet additional winter peaking capacity. 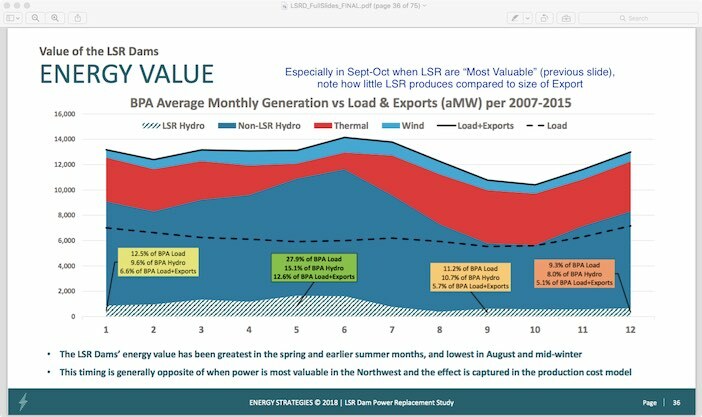 The least-cost solution for providing new peaking capacity is to develop costeffective demand-response resources, the voluntary and temporary reduction in consumers' use of electricity when the power system is stressed. The Northwest's power system has historically relied on the hydrosystem to provide peaking capacity, but under critical water and weather conditions we'll need additional capacity to meet the region's adequacy standard. In all of the scenarios and sensitivity studies examined by the Council, similar amounts of improved efficiency are found to be cost-effective even without carbon costs. If carbon reduction policies are enacted, efficiency improvements can help the region meet those goals. In all scenarios tested by the Council, the amount of cost-effective efficiency developed averaged between 1,200 and 1,450 average megawatts by 2021 and between 3,900 and 4,500 average megawatts by 2035.
from an aggregate regional perspective, which is the plan's focus, the need for additional new natural gas-fired generation is very limited in the near term (through 2021) and only slightly higher in the mid-term (through 2026) under nearly all scenarios. That is, options for new gas-fired generation are brought to construction in only a relatively small number of futures. Across most scenarios that did not assume additional coal plant retirements beyond those already announced, the probability of gas development is less than 10 percent by 2021. By 2026, the probability of constructing a new gas-fired thermal plant increases to almost 50 percent in scenarios where utilities are unable to develop demand response, and to over 80 percent in scenarios where existing coal plants and less efficient gas-fired generation are retired to lower carbon emissions. Todd Myers environmental director at the Washington Policy Center and a member of the Puget Sound Salmon Recovery Council.